Team dynamics in healthy and unhealthy teams are huge factors in the success or otherwise of launching new products, as well as keeping everyone motivated to meet problems head on and work around seemingly insurmountable obstacles in the workplace. In the book “The Advantage,” author and coach Patrick Lencioni points out how little the members of executive teams tend to know about one other even though they may have worked together a long time. Why is that? It's certainly doesn't speak well for building healthy teams. Asking the question “tell me about yourself” can be a great icebreaker but it’s often asked in the context of I want to understand “what makes you tick?” rather than really I'm really interested in getting to know you. The notion of a healthy team is often described in mechanical engineering terms: "makes you tick", "dynamics", "a well-oiled machine", "firing on all cylinders", etc. We are not machines. We have souls. It’s important stuff to address. The tensions of self-protective behavior and lack of openness with the need to get a job done becomes a group affliction, affecting how team members interact and deal with difficulties for the duration. We see this all the time in the many of the decisions we make in our jobs and the statistics on employee engagement are strikingly bad. 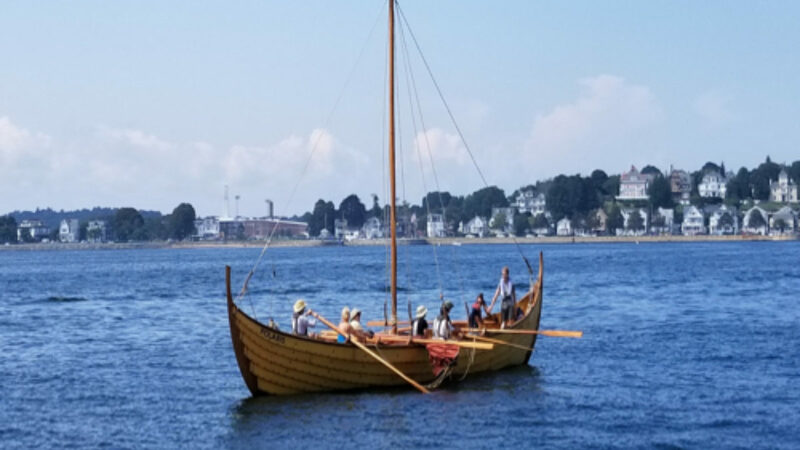 Far from just another metaphor, rowing and sailing an actual replica of an ancient wooden ship, complete with the sounds, scents and imagination of literally being in the ‘same boat’ is a very human experience that extends back thousands of years. Our experience is that such an activity exposes a group to trust building processes which help that group transform though various stages of getting to know one another in a realistic and yet safe environment. Underway, this awkwardness and lack of cohesion translates into erratic motion as each begins by rowing within their comfort zone. The group attempts to row in time but earns no prizes for keeping a steady rhythm. We are "all at sea" and feeling a bit overwhelmed as oars and upper bodies gyrate all over the place. It’s at that point that we bring out the ‘tell me about yourself question,” though we are likely to ask you to sing it! "I was born in … I was the youngest of five siblings…we were poor, etc. " The quality of singing might be terrible, but there's nothing more authentic or powerful than overcoming vulnerability to belt your lungs out for the good of the boat. Aboard Polaris, we offer the safety to “be yourself” and remind our clients of the “Vikings' sagas” and the importance of stories. No one besides yourselves and the seagulls can hear you. As long as your song matches the rhythm of the stroke, some encouragement from your teammates along with a few tips on rowing more effectively, soon everyone's senses begin to wake up and somehow magically their timing improves. It’s not long before the group is rewarded by the sound of a single splash as many oars hit the water in unison and the water flows along the hull gracefully. Suddenly this is easy! We are doing it together. Now we can think about our mission. The team is maximizing their efforts and approaching the task with the same priority. You are officially the coolest looking group out there. Before, there was awkwardness and apprehension about what’s to come accompanied by nervous laughter and corny Viking jokes. Afterward, there is flow in conversation, genuine laughter, and satisfaction at having mastered something difficult; the team sharing in their successful effort to complete the goals we set for the day. The team has worked together to take control of a completely random set of experiences, achieved their objectives and done it all in ever changing circumstances. Far from just another metaphor, being in the ‘same boat’, rowing and sailing an actual replica of an ancient wooden ship, complete with sounds, scents and imagination building helps a corporate team ease through various stages of getting to know one another in a realistic and yet safe environment. We invite you to join us in 2019. It's like work but more fun!